Gloriousness. Mountains of gloriousness. This is our second year participating in a CSA. If you don’t know, CSA stands for Community Supported Agriculture. Basically, you pay the farmer for a “share” of the season’s produce. As a CSA member, barring farming catastrophes like drought, you get to enjoy the abundance of freshly-picked fruits and vegetables all season long! Since my grandparents’ gardens are a thing of the past and I have yet to start a garden of my own, these weekly CSA boxes are the next best thing. And, since I’m such a salad freak, the first couple weeks are always my favorite. Greens, greens, and more greens. There are tons of farms that participate in CSAs. Every farm has slightly different offerings, so it’s best to look into all the options. Some offer exclusively organic. Others don’t spray, but haven’t gotten organic certification yet. 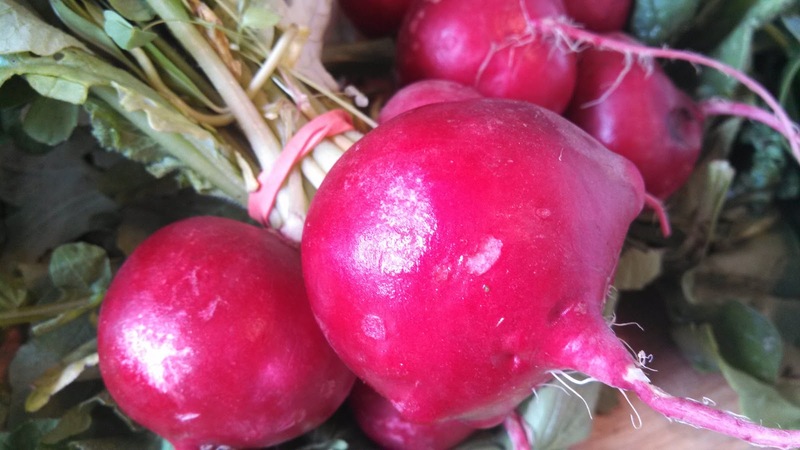 You might find that you can only get a produce item you really love from one or two farms. Some have special items that can be ordered for an additional cost like mushrooms, coffee, or animals products like eggs, meats, and cheeses. Of course, I’m not thrilled to see animal products offered no matter how “local”, “grass-fed”, or “organic” it is, but I do get pretty excited for the mushrooms. Even though it’s just my partner and I in this house, we get the family-sized share. With me eating primarily raw foods and him focusing on eating more whole foods, we devour more produce than the average family anyway! I’m really pleased with our first box, and I already have plenty of ideas of things to make. I’m not sure what I’m going to do with all the rhubarb. 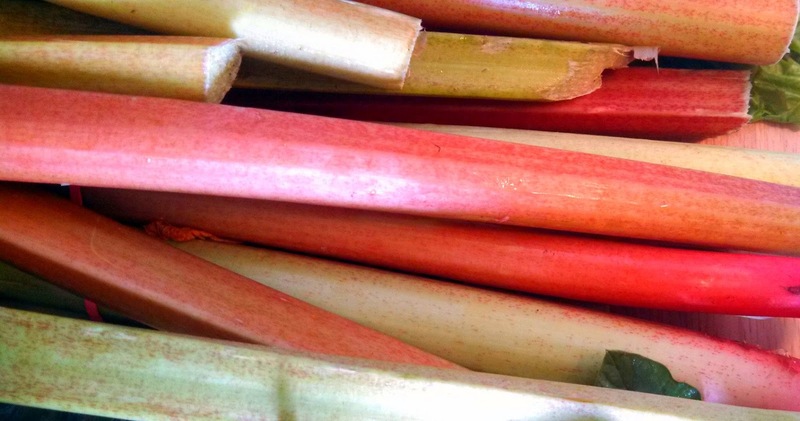 A lot of rhubarb recipes call for sugar, and that’s not really my thing. I love the stuff though, so I’m sure I’ll come up with something creative. Pictured above: 4 heads of leaf lettuce, 1 bunch of chard, 2 bunches of radishes, bag of spinach, bag of mixed greens, rosemary, thyme, bunch of basil, 2 bunches of rhubarb, and a loaf of hearty 7-grain bread. The bread was a random add-on from them. Every so often we’ll get something special thrown in. I see panzanella in my partner’s future, maybe some pesto (how could I not? ), raw chard soup, and many delicious salads!